John Denver died 16 years ago this week when the small plane he was piloting crashed into the Pacific Ocean. He was 53. This year, a bit of Denver’s dream died with the sale of land that had housed his Windstar Foundation, which focused on the environment and other issues. 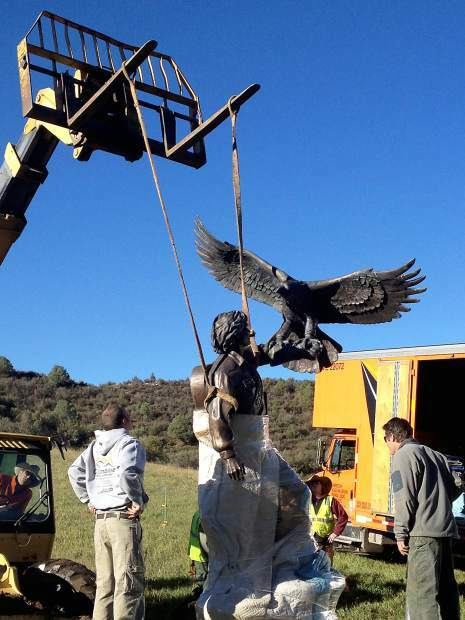 Aspen Times photographer Scott Condon took this photo of John Denver’s “Spirit” statue being removed from the property of the former Windstar Foundation. Forty years ago, Denver had a huge hit with “Rocky Mountain High,” a song inspired by his love for Colorado (not drugs, as he testified before Congress). The song was named an official state song by the Colorado General Assembly in 2007, five years before voters here approved recreational marijuana. Earlier this year, Denver’s music experienced a mini-renaissance thanks to The Music is You, a tribute album featuring Dave Matthews, Emmylou Harris, My Morning Jacket, and other artists. The tribute album gave critics a new chance to assess Denver’s musical legacy, but meanwhile, Denver’s vision for Windstar has faded with the sale of nearly 1,000 acres of land near Aspen that he donated to the foundation. The son of a Catholic mother and Protestant father, Denver was one of the most popular recording artists of the 1970s. He was attending Presbyterian Church of the Covenant in Tucson, Arizona when he began doubting Christianity and experiencing visions about the universe and his future. In 1976, Denver and a partner founded Windstar on a 957-acre property near Snowmass. Now Windstar has sold the property and relocated what remains of Windstar to nearby Basalt. Locals worry that the property Windstar conserved for 37 years will be developed without respect for the area’s beauty. Finally, in September, a statue of Denver entitled “Spirit” was moved from the former Windstar to the Colorado Music Hall of Fame in Denver. Here, fans can appreciate Denver’s work. Meanwhile, back in the Aspen area, the worries about the Windstar land continue. Move Over Tatooine: Two (or Three) Suns Better than One! Cures for the Political Blues: Carson & Clinton 2016? Will the GOP “Lose Its Head” in Cleveland?